Hello and Happy Birthday to Jen! 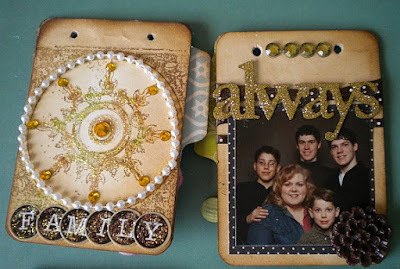 Welcome to her Fabulously 40 Blog Hop. You have probably here from Jackie but if you want to start at the beginning you can pop over to Jen's. In honor of Jen's birthday I was inspired to create something I know I would love to receive as a gift! And since I rarely make things just for myself I decided I would do just that. So, here is a gift for me but I will share the idea with all of you! Be sure to read to the bottom...there is some very exciting blog candy I will be sharing with you as well! 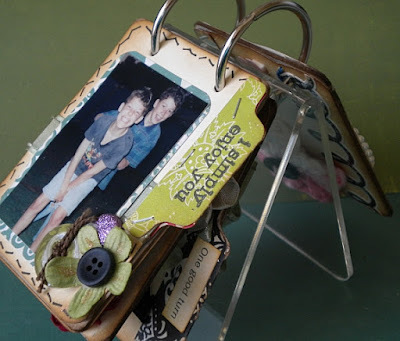 This fabulous Maya Road Clear ATC Stand is now available at Paper Patch Crafts. I love it! It includes the chipboard ATC (artist trading cards) and the metal rings..you supply the imagingation. 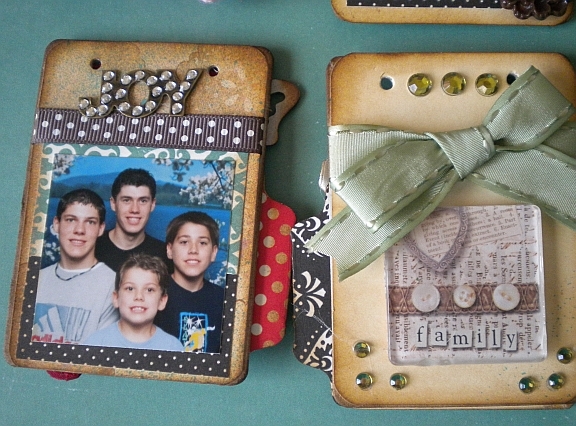 The majority of the supplies I used to decorate my flip album were also purchased at Paper Patch Crafts. They have so many fun items items from companies such as: Maya Road, Echo Park, Kaiser Craft and more. I used file tabs on the sides of my flip pages for a little added cute-ness. The crochet flower is demonstrated at a previous post over here. The photos are of my adorable sons from many years ago. I decided this would sit on my desk at work so I can look back on the good days when they were younger. The paper line I used is For The Record from Echo Park. 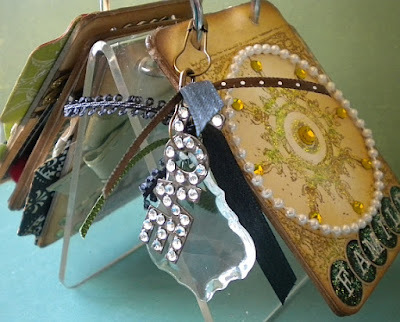 The Butterfly is Maya Road and comes in an assortment of blank chipboard. I used Hydrangea Blue Maya Mist and then covered it in stickles. What would be a birthday without gifts and candy? Blog candy to be more specific! Anne, the owner of Paper Patch Crafts has generously donated a $10 gift certificate to her fabulous online store! In order to win the candy you simply need to click the button to become a follower at my blog and leave a comment. It is mandatory that you also leave me your email address. While I do appreciate your blog address and will enjoy checking it out as well...I still need your email address so that if you should win I can notify you. Unfortunately if you neglect to, I will have to pick someone else. 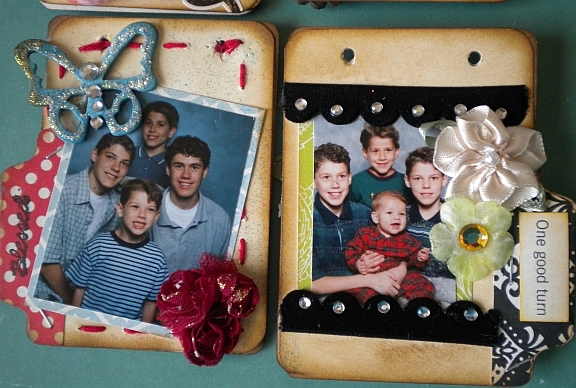 I hope this project has inspired you! I also love your comments! 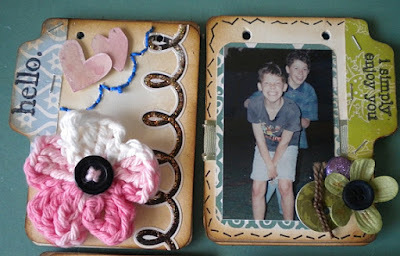 Now, to continue onwards in this hop...go on over to Susan's Blog. Wow Wow Wow, I love this. Great job. this is great-----I have got to order this so I can try my hand at this. Wow, I really love this, I just love the stand for it, great job...love it, love it!!! Wow, this is a stunning mini album! TFS. I just found your blog and am now a follower. So nice to meet you. Stop by my blog sometime soon and say hello. Simply gorgeous album! Who wouldn't love to get that as a gift! Love all the lil details and bling and all! TFS! love this idea, Its a super great birthday gift. I love your flip album and want to make some as gifts myself. What a stunning project. Love the colors and all the details in your album. You did a fantastic job on this one. Thanks for sharing. I'm a new follower. you did an amazing job with this. i love all of the details. so cute. Wow, I love your mini album! Very cute! TFS and I am your newest follower!